The Acadian Museum of Erath honors long-time Vermilion Parish cultural and economic leader, Charles E. Broussard, for his lifetime of dedication to the preservation and advancement of the French heritage in Louisiana. CODOFIL President, Warren A. Perrin said, “Mr. Charles Broussard was one of the principals who helped to create CODOFI in 1968 by urging its creation to the political leaders of the state. He has never stopped working to insure that the organization achieves its mission: promotion of French for economic, cultural and educational purposes. For his dedication we will be eternally grateful". The career of Vermilion Parish Businessman, Charles Broussard is long, varied and noteworthy. 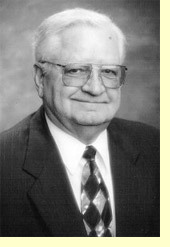 After attending LSU and SLI, Broussard acquired one of the first export licenses issued by the U.S. Government in 1946. While serving on Gov. Earl Long’s campaign committee in 1957, he was able to convince the Governor to get the Gueydan Drainage Canal dug to the Schooner Bayou Control Structure. With the help of Congressman Ed Willis and Senator Allen J. Ellender, Broussard then started the first Water Hyacinth Control program in the U.S. He then joined the Gulf Intracoastal Canal Association and participated in making a documentary on the significance of the Intracoastal Waterway to the U.S. economy. In 1965, Broussard convinced the Governor to dredge the Four Mile Canal section to serve Intracoastal City. His support of Vermilion Parish did not go unnoticed as President Lyndon B. Johnson and Richard Nixon both appointed him as their personal political advisors. With this political clout, Broussard then convinced the USDA and the State of Louisiana to jointly open up a Livestock Export Center at Acadiana Regional Airport in New Iberia which exported cattle all over the world. In 1968, when CODOFIL was created, it was Charles Broussard who accompanied James Domengeaux to Baton Rouge to convince Gov. McKeithen to help preserve the French language in Louisiana. Broussard was very instrumental in the political campaigns of many including; Senator Bob Kennon, Governors Earl Long, John McKeithen, Edwin Edwards, Mike J. Foster, and District Attorney Nathan Stansbury. In 1976, Gov. Edwards designated Broussard to be his replacement in a meeting between he and Prime Minister Hatfield of Canada to help resolve the differences between Canada and Louisiana.